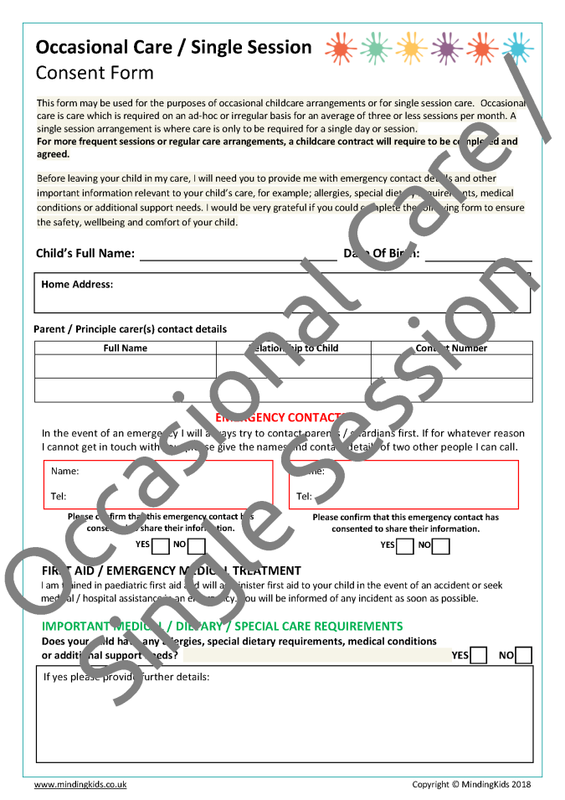 Collect essential information from children and families and request all of the necessary permissions using these professional care plans and consent forms. 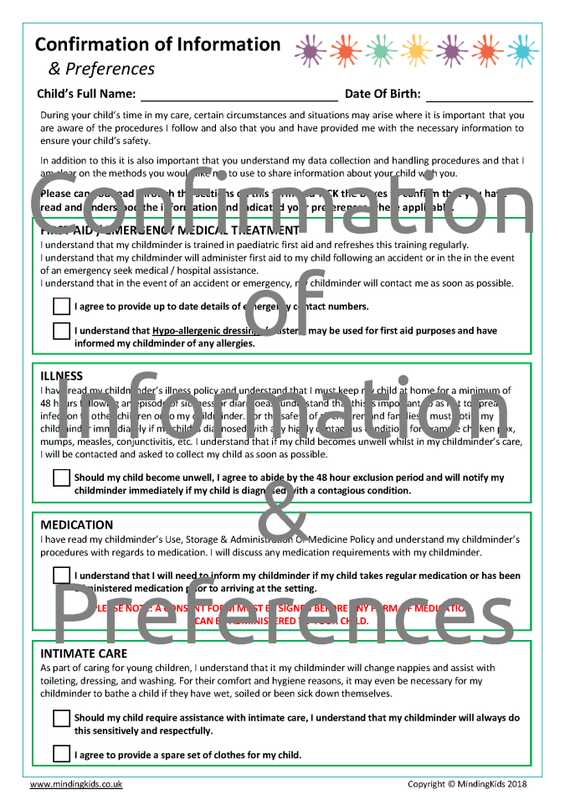 Designed to assist with GDPR compliance. 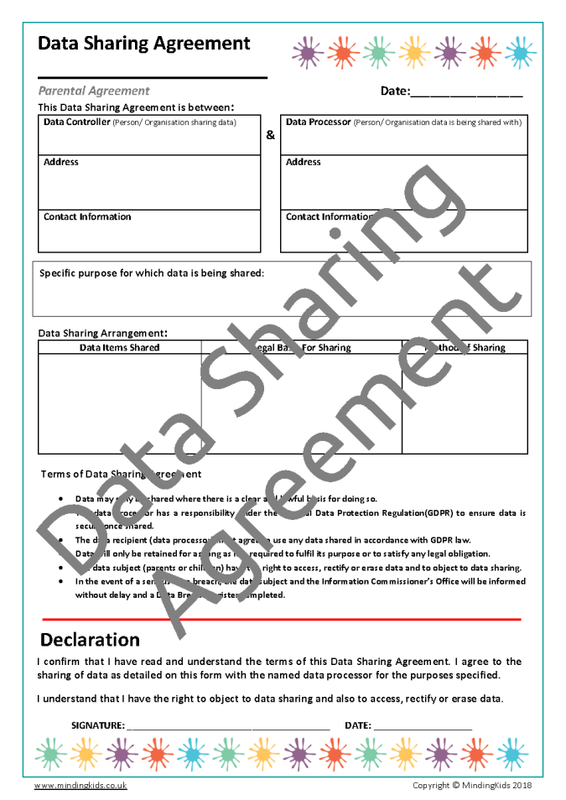 Includes Data Sharing Agreement form and examples! 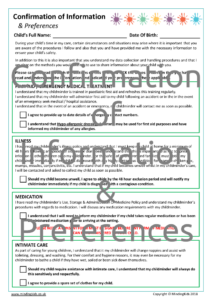 Collect essential information from children and families and request all of the necessary permissions using these professional care plans and consent forms. 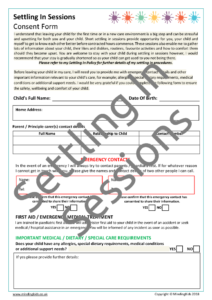 All of the items in this pack have been designed to assist with General Data Protection Regulation (GDPR) compliance. 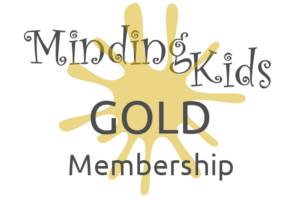 For further assistance with GDPR, please refer to our FREE Guide for Childminders and Childcare Providers and our GDPR ToolKit! 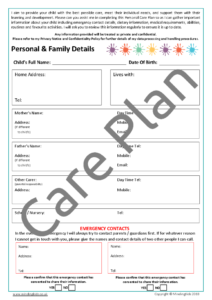 Before commencing any childcare arrangement, it is vital that you obtain essential information such as emergency contact details, dietary information, medical requirements or additional support needs. 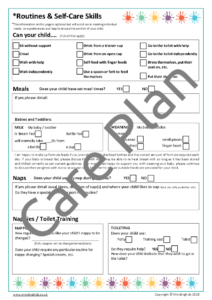 Requesting further details such as abilities, routines and favourite activities can also help you to meet individual needs and care requirements. These professional Care Plans will allow you to collect all of the information that you need. 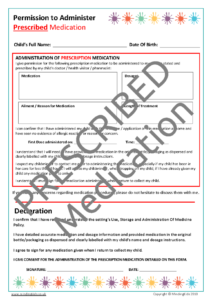 Registration Information – details agreed attendance times, emergency contacts, doctor’s information, allergies, special needs, etc. 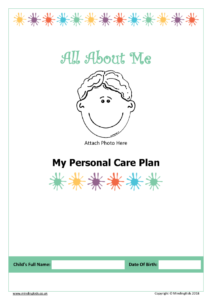 Child Information / All About Me – collect information regarding each child’s likes, dislikes, favourite foods, routines, self care skills, etc. 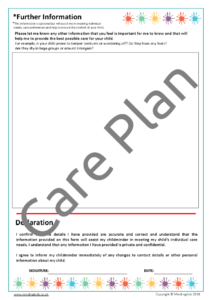 Also includes Care Plan Review Record – Keep track of each time a care plan is reviewed or updated with new information. NOTE: If you provide care for a child with specific health care requirements, for example allergies, asthma, experience seizures, require a special diet or have a medical condition – You may also be interested in our Health Care Plans. 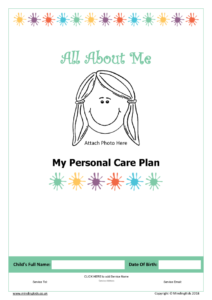 It is important that parents and carers are aware of the procedures you follow in certain circumstances and that you are also clear on their wishes. 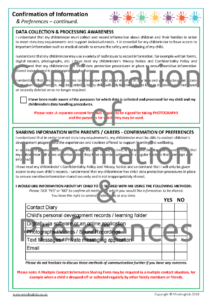 This Confirmation of Information & Preferences Form goes over important information that parents will need to be aware of and requests that they tick to confirm that they understand certain policies and procedures. 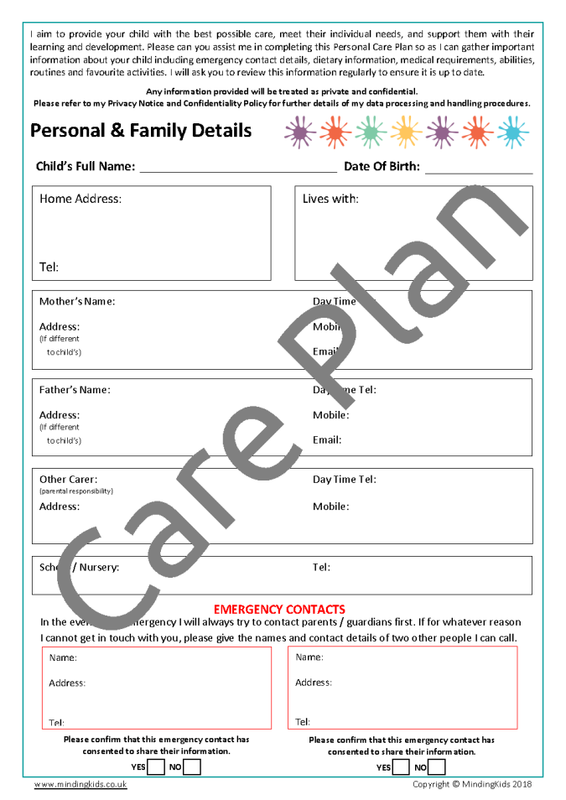 The form also summarises your data protection and handling procedures and allows parents to clearly indicate their preferred methods for sharing information about their child. 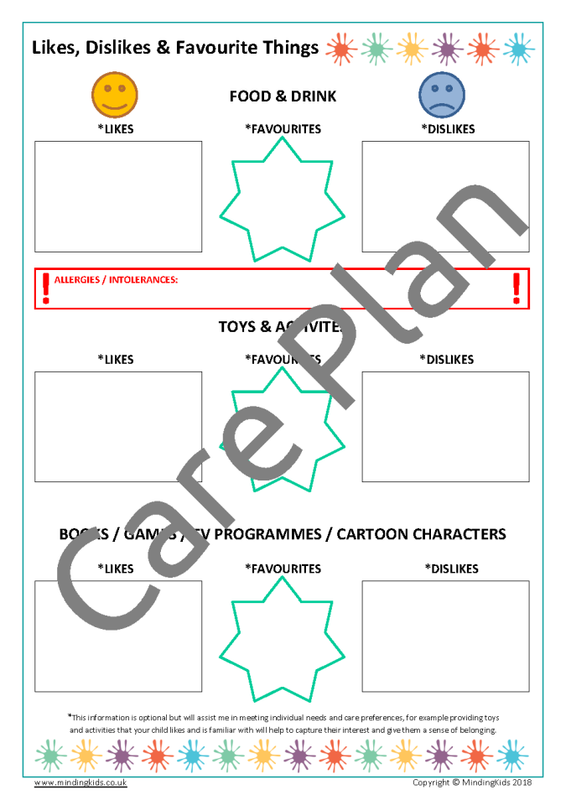 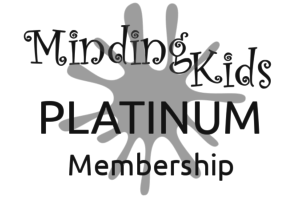 Keep alongside each child’s care plan as evidence that you have gone over important policies and procedures with parents and requested their information sharing preferences. 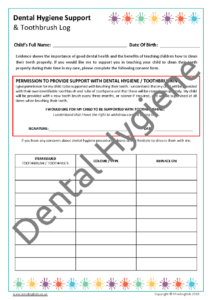 There are certain activities where you must request written consent. 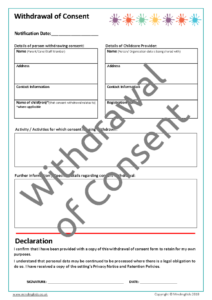 In line with the General Data Protection Regulation, consent must be clear and specific. 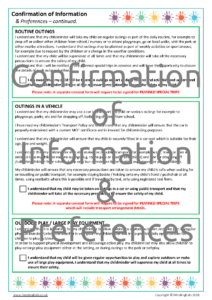 These professional forms allow you to explain in detail the individual circumstances for wish you are requesting consent and allow parents to clearly indicate their choices. 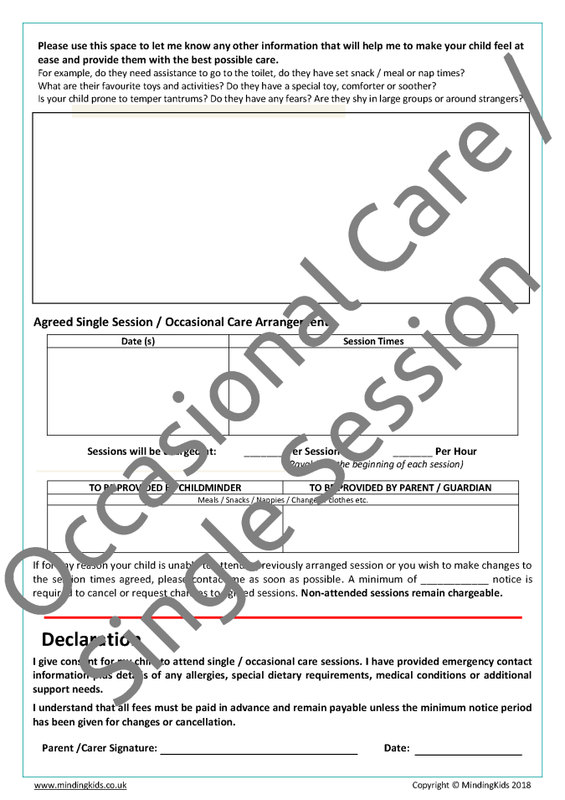 Before formal childcare arrangements begin, you may like to offer settling in sessions. 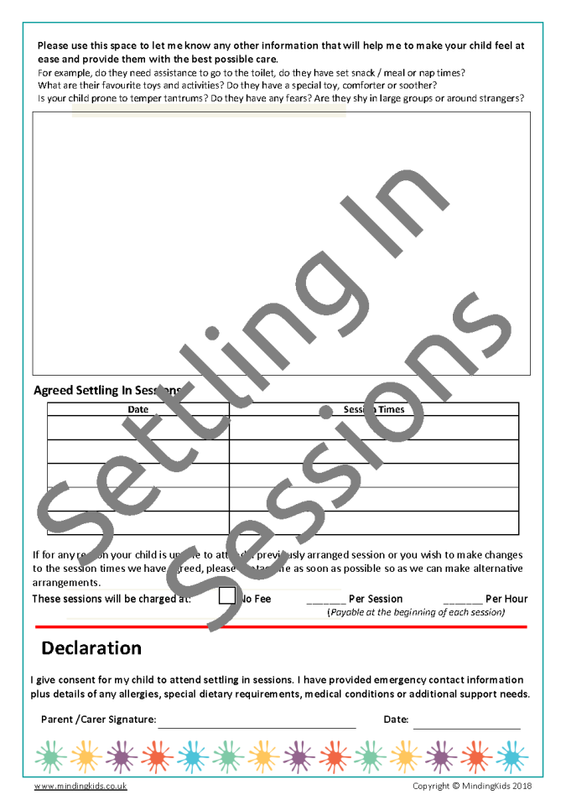 Settling in sessions provide the opportunity to get to know children and families and gather lots of information about likes, dislikes, routines, favourite activities, etc. 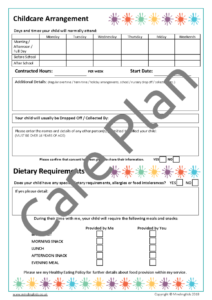 before contracted hours commence. 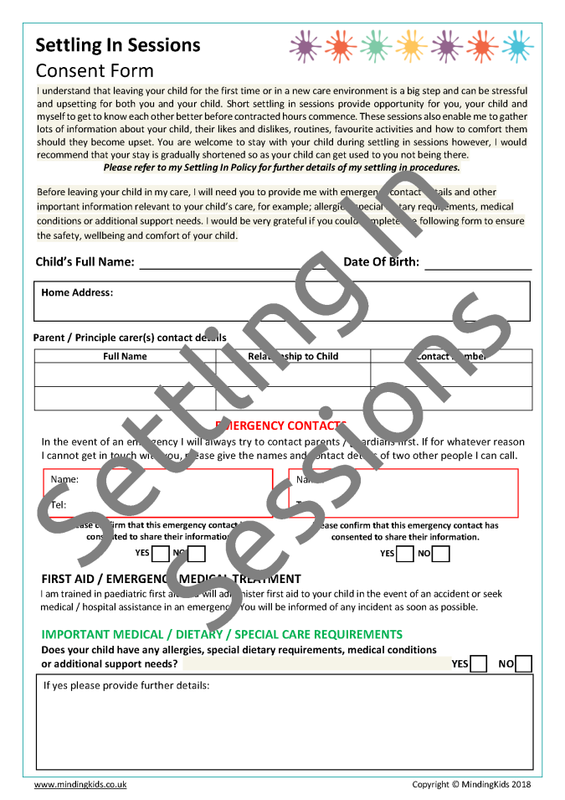 Whilst these sessions may be short, it is essential that parents provide you with important information about their child, for example; allergies, special dietary requirements, medical conditions or additional support needs and emergency contact details. 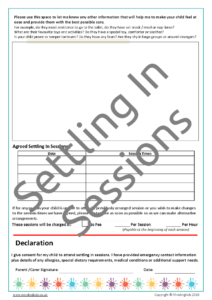 This Settling In Sessions Consent form will allow you to gather all of the information you require plus detail the agreed dates and times of settling in sessions and any relevant charges. 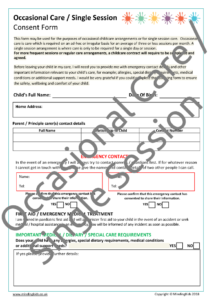 There may be situations where you are asked to provide care on an ad-hoc or irregular basis or when only a single session of care is required, for example to provide alternative care for a fellow childcare provider. 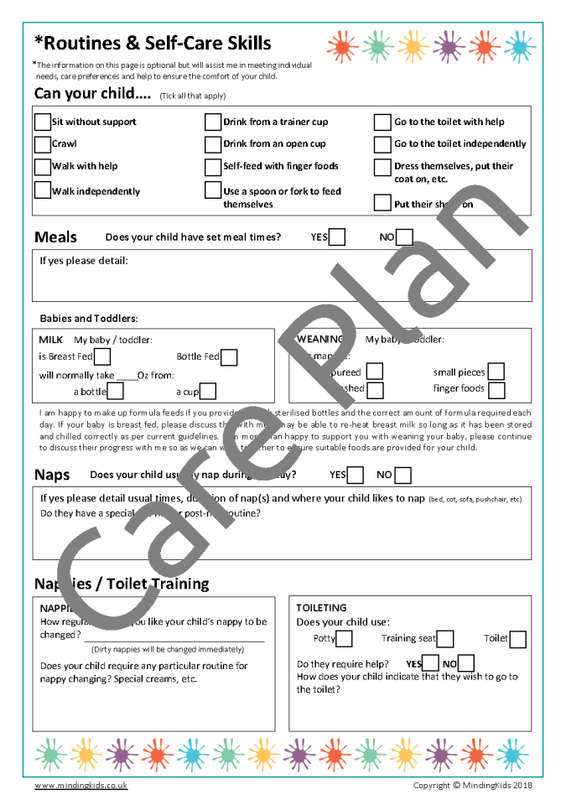 Like with any childcare arrangement, it is essential that parents provide you with important information about their child, for example; allergies, special dietary requirements, medical conditions or additional support needs and emergency contact details. 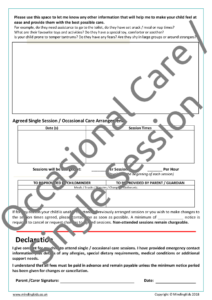 This Occasional Care / Single Session Consent Form will allow you to gather all of the information you require plus detail the agreed dates and times of sessions, charges and payment information. 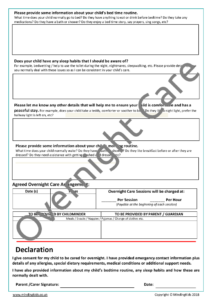 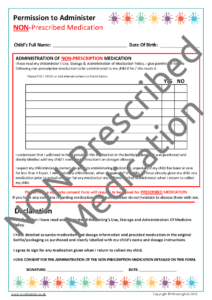 Use this form when care is to be provided overnight. 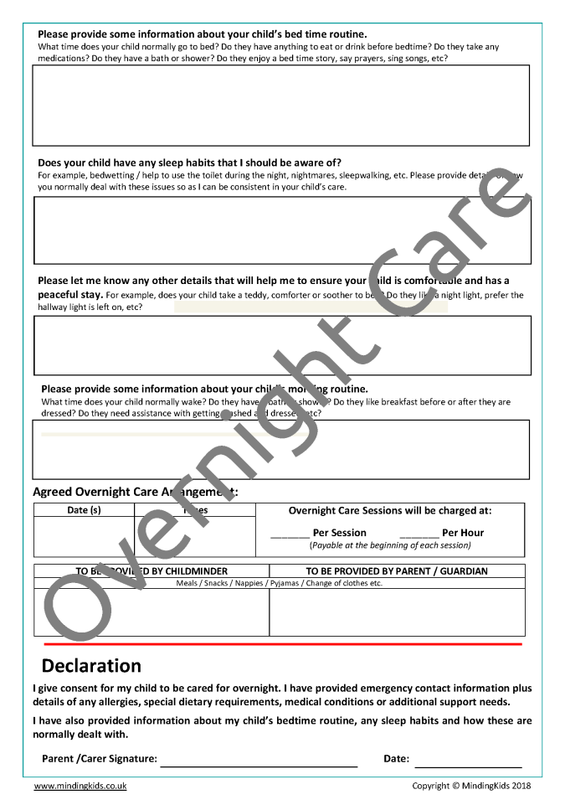 Ensure you have essential details to hand and obtain useful information regarding bed time activities and sleep habits so that you can support existing routines and ensure the comfort of the child. 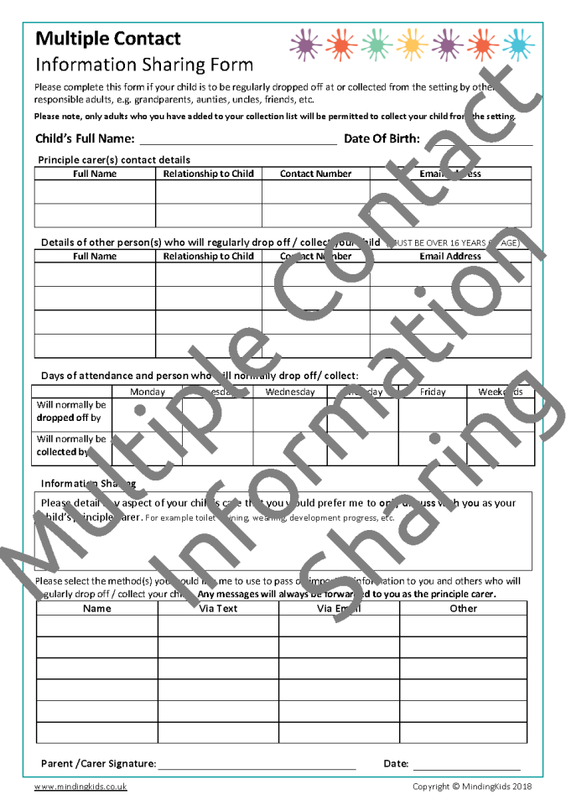 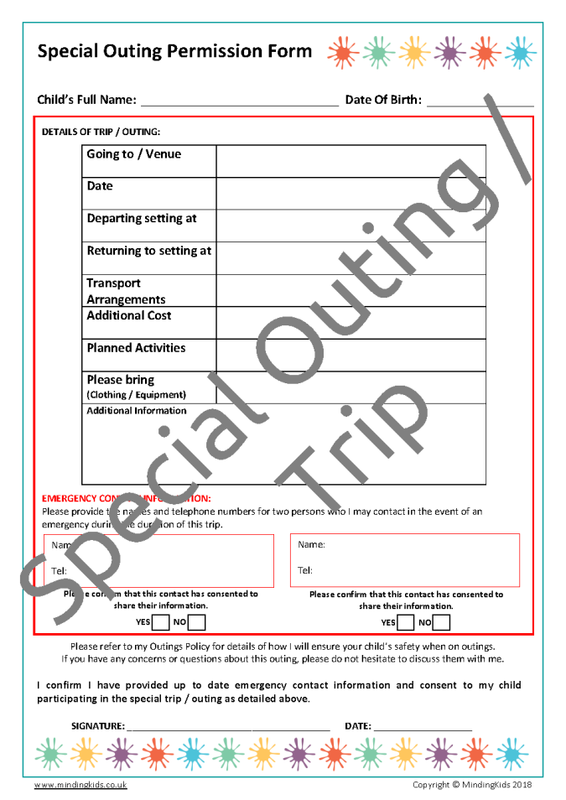 Use this form when children are to be regularly dropped off at or collected from the setting by other responsible adults, e.g. 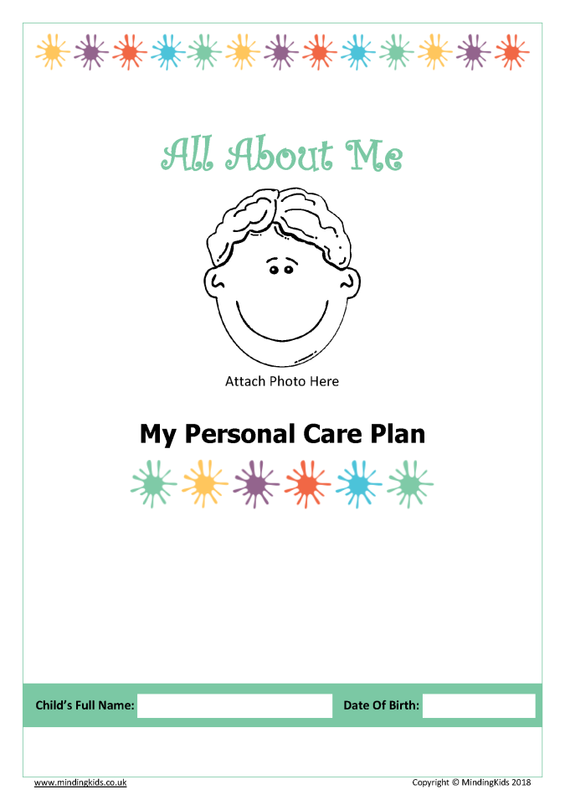 grandparents, aunties, uncles, friends, etc. 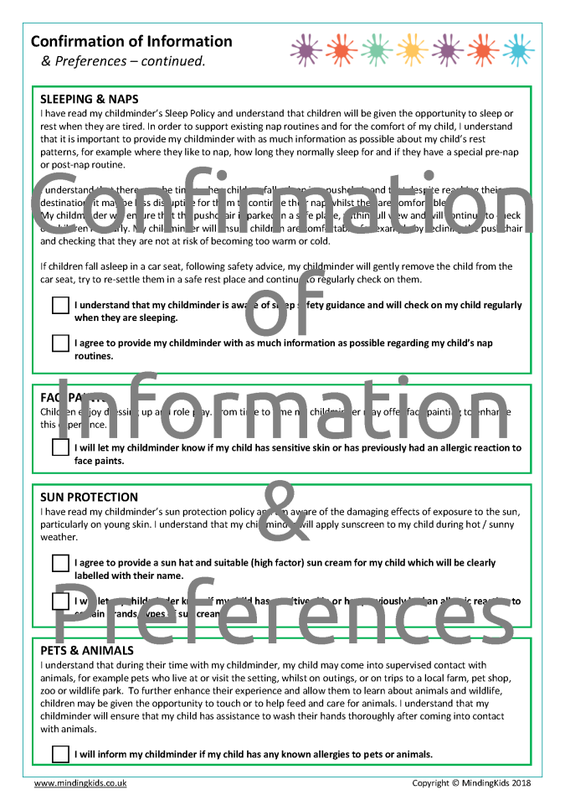 Confirm what information parents are happy for you to discuss with other people who collect their child and establish an effective system for passing on important messages. 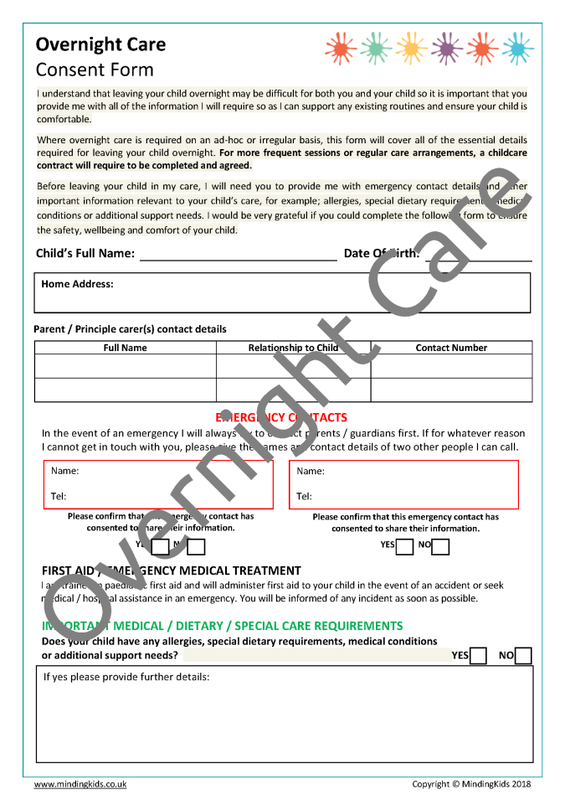 – See also Multiple Contact Policy in the Policies & Procedures Pack. 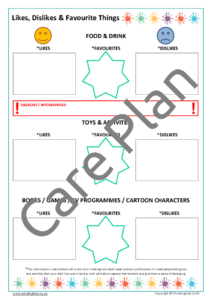 You may come across some situations where it may be beneficial to share or discuss information about a child with other relevant professionals, e.g. health visitor, nursery / school teachers, speech therapist, social care professionals, health service workers, special needs coordinators, etc. 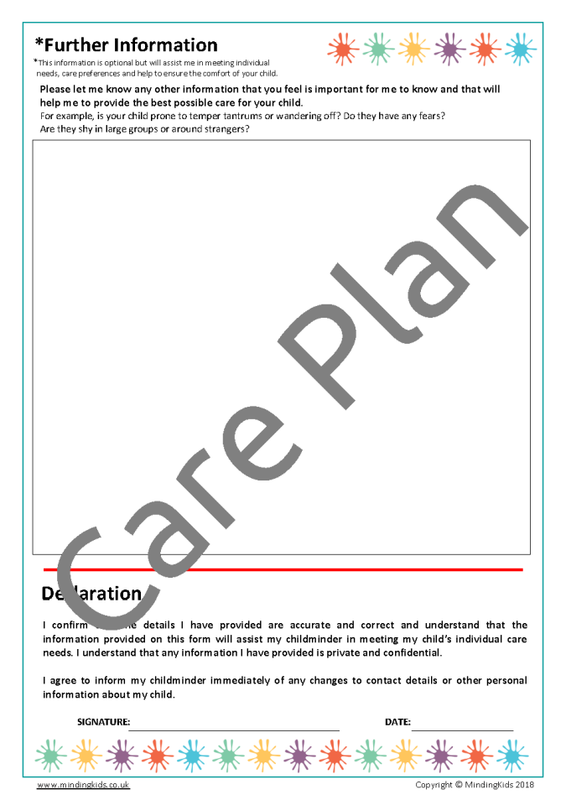 In some circumstances, sharing information with others may also be necessary, for example applying for funding from the local authority. 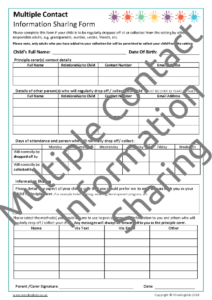 With the exception of legal requirements or safeguarding concerns, you have an obligation to inform parents about any information sharing arrangements with other professionals and organisations and request their consent. 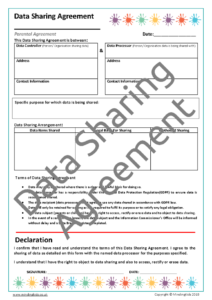 This Data Sharing Agreement form will ensure that parents understand fully what information is being shared, with whom and for what purpose. 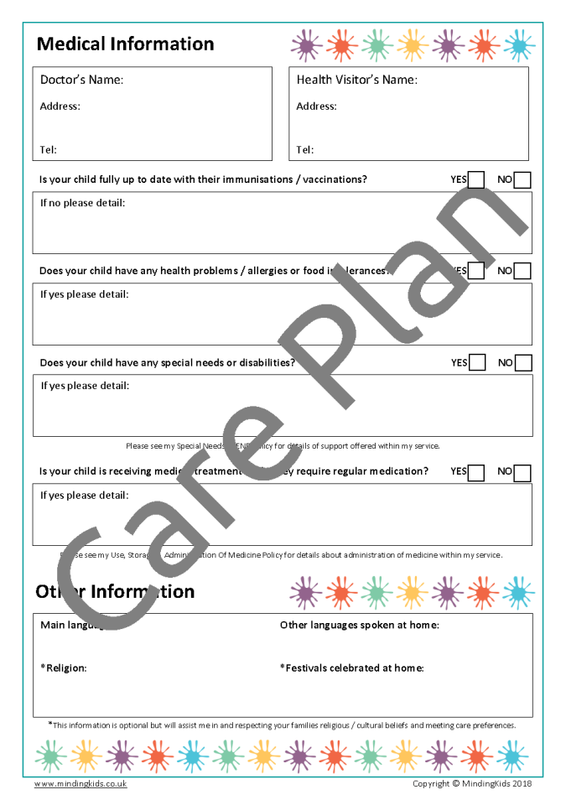 Examples provided for: Local Authority Funding Application, Health Visitor – 2 Year Progress Check, Shared Care Arrangement, Speech Therapist and SEN Co-ordinator. 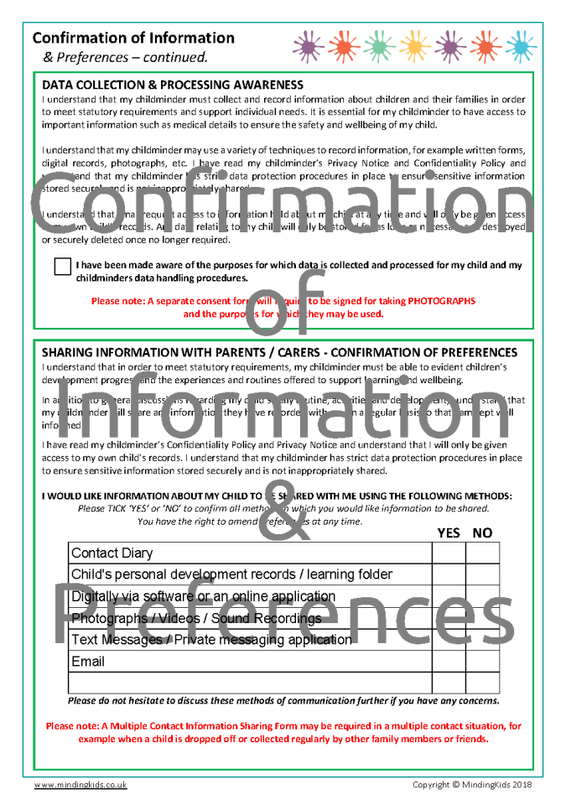 Under the new General Data Protection Regulation (GDPR) parents may choose to withdraw consent at any time. 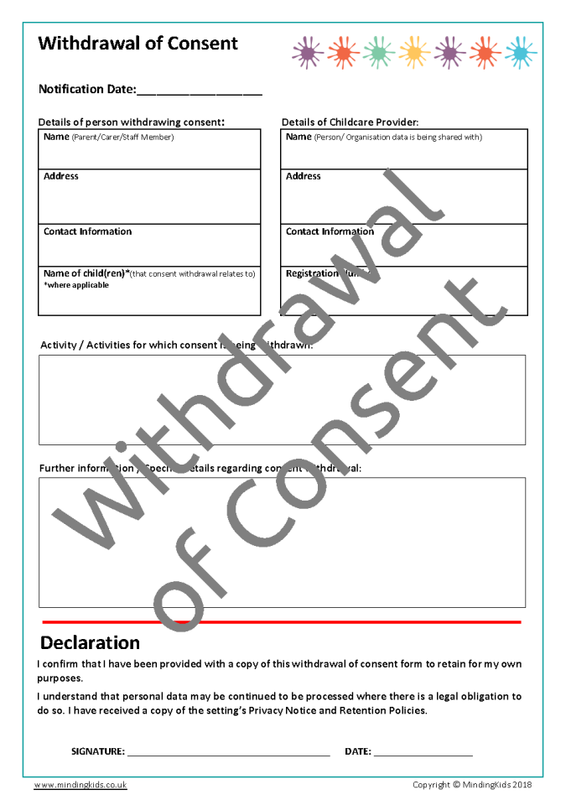 Use this form to keep a record of the parent’s request, detailing the activity for which consent is being withdrawn and any specific details or information. 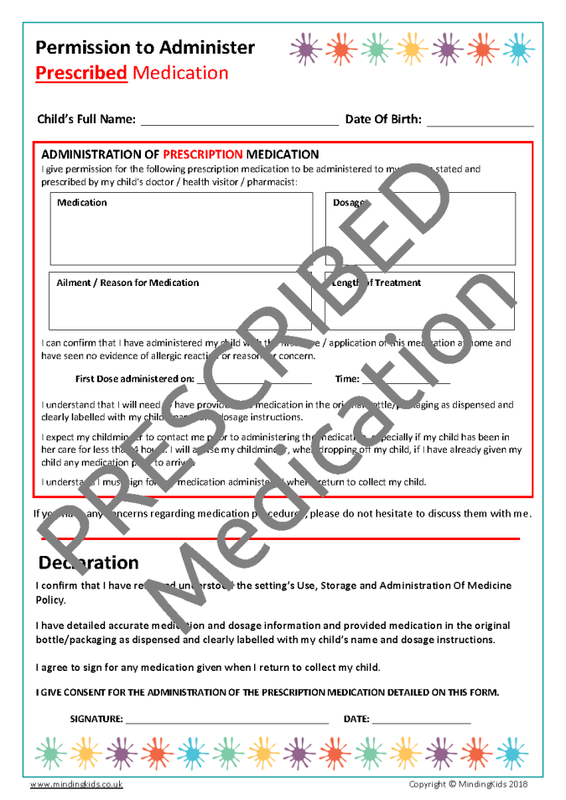 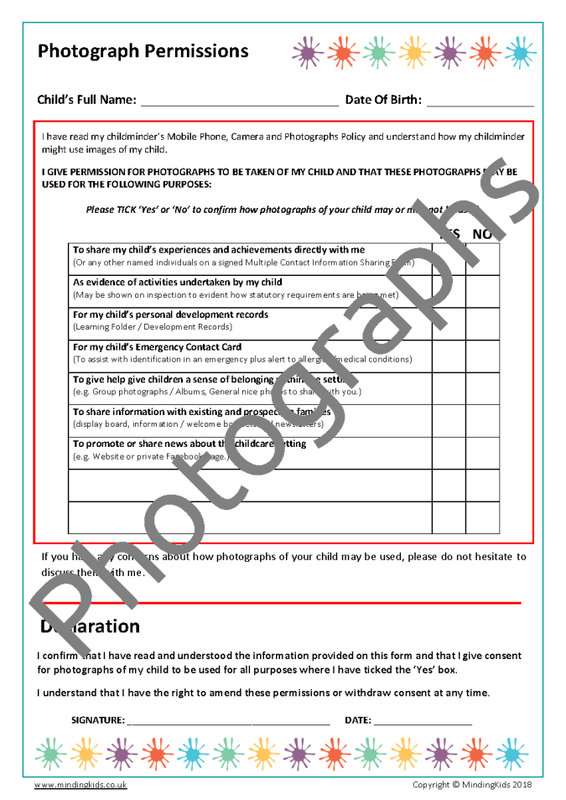 Provide parents with a copy and ensure you keep one for your own records. 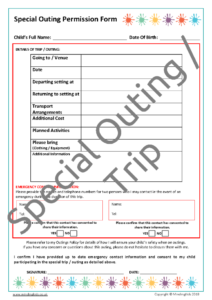 All documents in this pack are supplied as PDF Forms.You can choose to print them out and complete by hand or use your computer / tablet to enter information before printing or saving / sharing digitally. 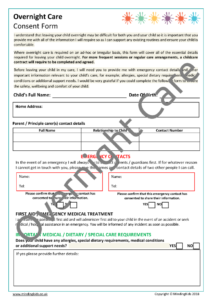 Please see the FAQ page if you require further assistance using PDF Forms. 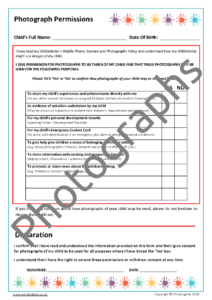 If you require any small alterations to the text within the forms, please contact us as we may be able to assist you. 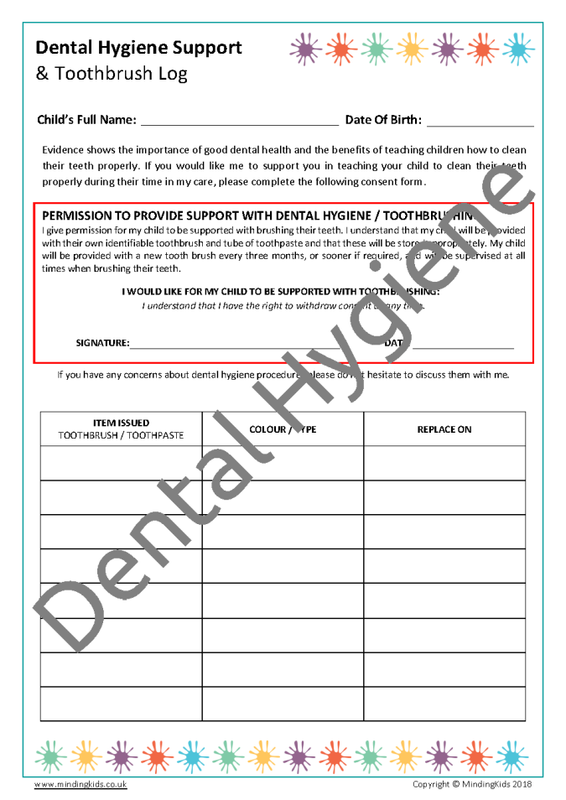 Please contact us with your requirements. 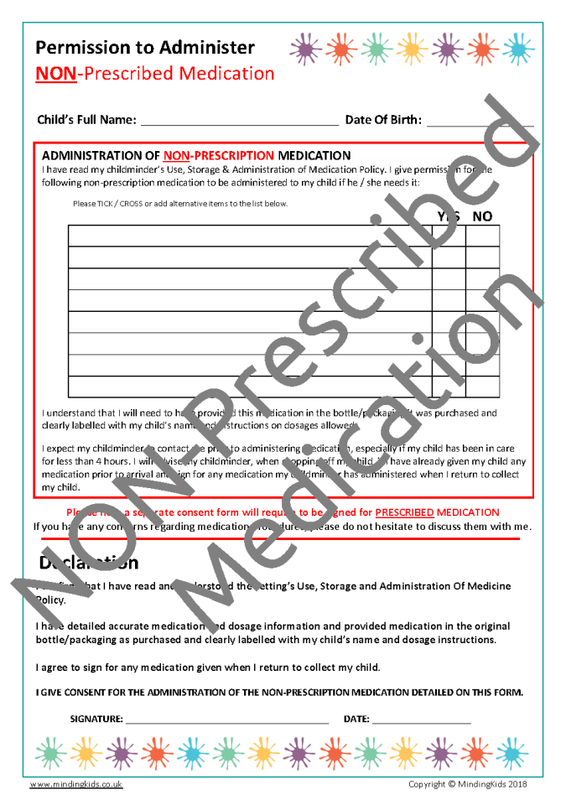 The download version of this pack is supplied as a ZIP FILE. 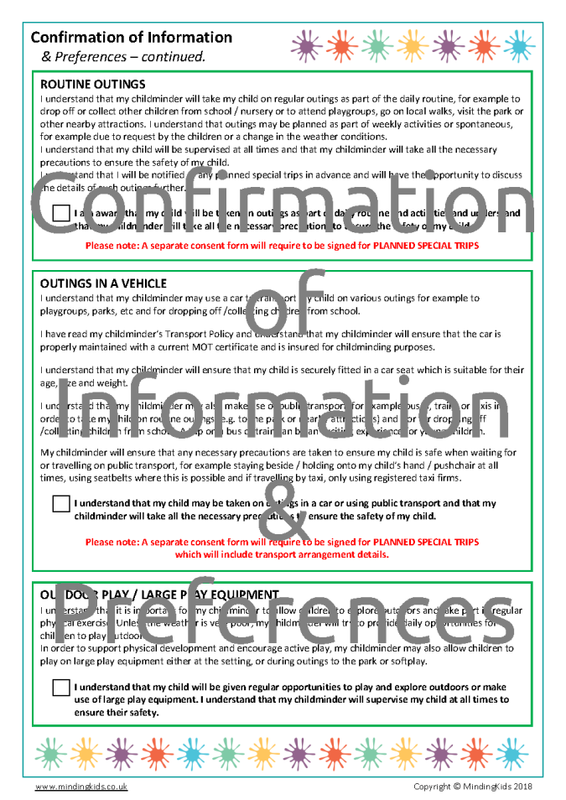 Please see the FAQ page for further information.